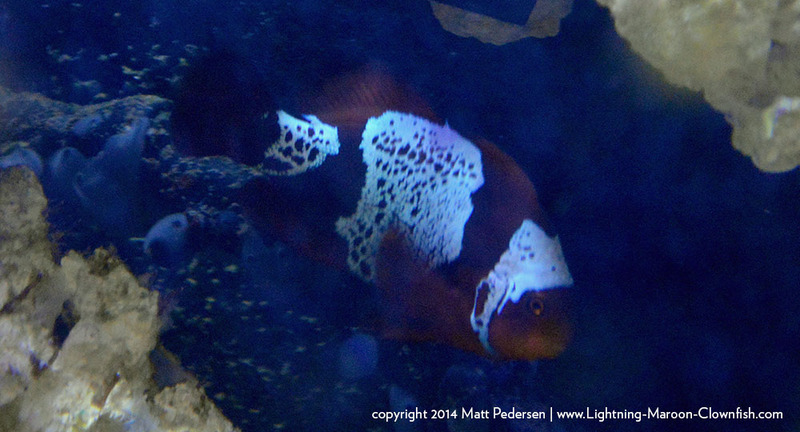 The Lightning Maroon Clownfish offspring (GL1 and GL2) I donated to the Great Lakes Aquarium in 2013, are now officially on display. GL1, the lower fish, foreground, carries the Lightning gene; it’s whit striped mate, above, does not. Late on Saturday evening, one of my FISHING friends (not to be confused with FISH friends) posted on Facebook that the official story had run online; this Saturday, September 7th, 2014, the Duluth News Tribune is running a story by Alysee Shelton about the Lightning Maroon Clownfish and its mate, which are now on display at the Great Lakes Aquarium here in Duluth, MN. 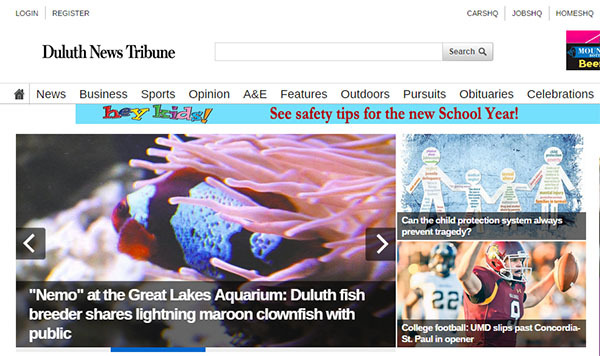 You can ready the story online here for the next coupld days - http://www.duluthnewstribune.com/content/nemo-great-lakes-aquarium-duluth-fish-breeder-shares-lightning-maroon-clownfish-public - Now, I should point out that the article isn’t 100% accurate. As you all know, I like to indulge in a bit of mythbusting (aka. Fact Correcting) here at the Lightning Project…the Duluth News Tribune will “suffer my wrath” (meant very tongue in cheek, affectionately), receiving a healthy dose of disambiguation just like everyone else. For starters, the fish were actually delivered to the GLA on August 2nd, 2013, which means they were behind the scenes for just over a year before being put on display, not the “6 months” the article mentions. The year behind the scenes is perfectly understandable given that aquarists were VERY busy with the new “Shipwrecks Alive” exhibit that was being put in place in the rotating exhibit hall to replace the “Masters of Disguise” exhibit, which was the replacement for the “Seahorses” exhibits I never got to see…but there’s another reason which I’ll cover in a second. I would remind readers that while this article suggests that “[SEASMART] decided to send that fish to Matt Pedersen, an international marine aquarium fish breeder in Duluth.”, that it was actually a) Blue Zoo Aquatics who had the final say in whether I would receive the fish (although my understanding is that all parties felt it was a good move) and b) they didn’t just “send” me the fish…yes, the rumors still persist that I was just “given” the Lightning Maroon! Shelton’s article also glosses over the actuality of numbers a bit, but that’s more due to the brevity of the piece and a word we’re all forced to deal with. For example, “produced their offspring, classified as lightning maroon clownfish, on June 29, 2012.” As most Lightning Project followers already now, only about 50% of the offspring wind up displaying the mutated phenotype (appearance) and therefore, only about half of them are actually “Lightning” Maroon Clownfish. I should mention this because one of my worst fears is that someone picks up this story and starts talking about the fish as if they are a NEW SPECIES (which they are certainly NOT). 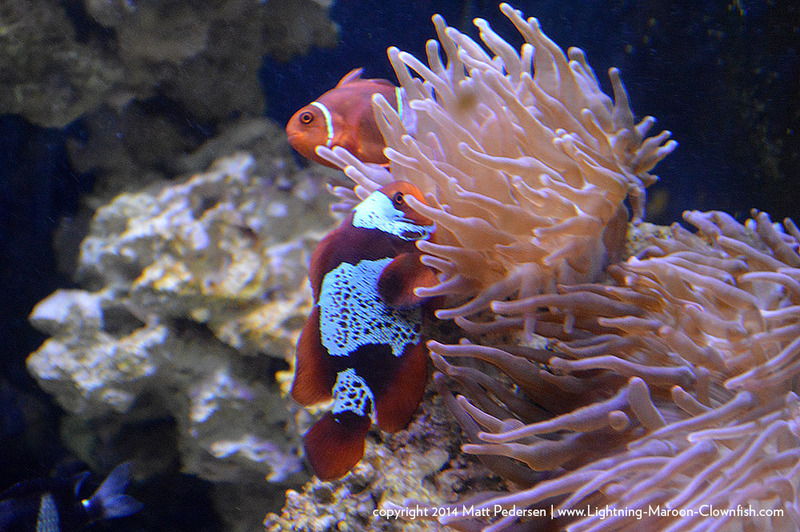 I will also point out a subtle fact that cannot be discerned from the article as written – the GLA only has one Lightning Maroon Clownfish; it is paired with a White Stripe (Normal) sibling. When you get caught up using a word like fish (same when singular or plural) I realized, as I read this piece, that you never can really tell whether you are talking about one, two, or for that matter dozens/hundreds/thousands. The article went on to state that “Great Lake Aquarium officials believe they are the first aquarium in the world to have these fish.” – I’ll emphatically say that “believe” suggests perhaps more room for doubt than is actually there. 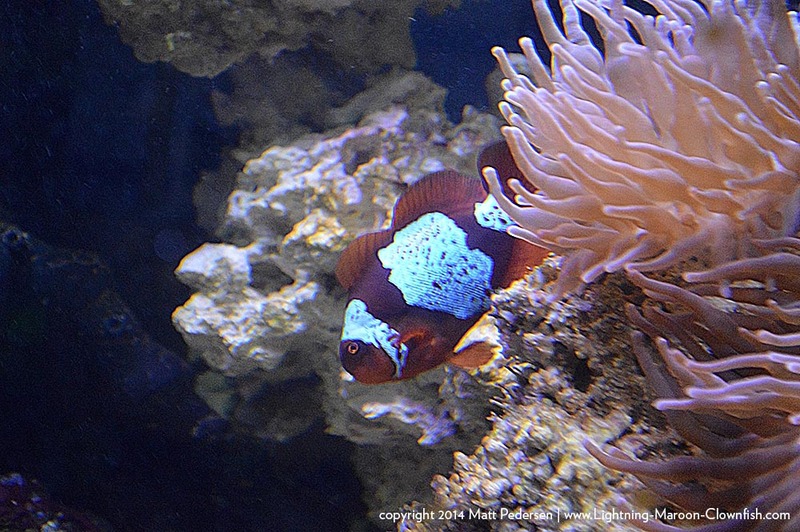 When it comes to “firsts” – and for a small public aquarium like the Great Lakes Aquarium, firsts DO matter – I am reasonably confident that they were the first public aquarium to have possession of a Lightning Maroon Clownfish (I could go back and check my records just to be 100% sure). Regardless of that, to the best of my knowledge, I am very confident that they can rightfully claim to have been the first and (to date) only public aquarium in the world to have this unique form on public display. I can say this with reasonable certainty given that I know where all the Lightning Maroons in my fishroom have gone…so unless someone “changed their minds”, I would presume that the Lightning Maroons that were sold in 2013 and 2014 are still in the same breeding programs they were when originally purchased…and not on public display. 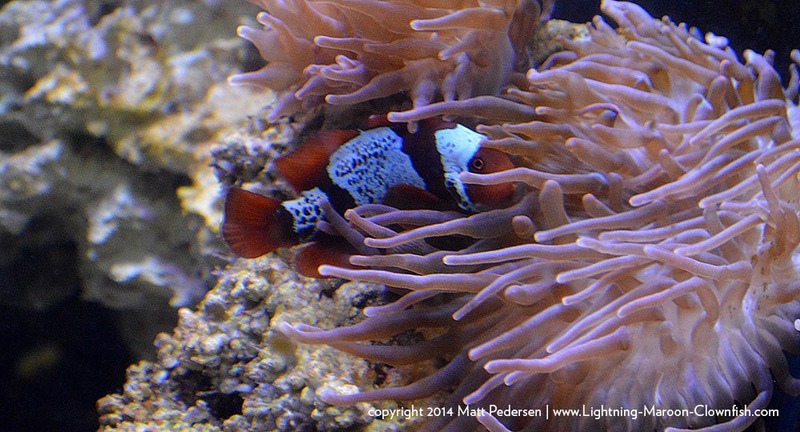 Will other aquariums in the future display a Lightning Maroon Clownfish? Perhaps…but I am proud that the GLA stands apart in the world, at least for now. I am truly delighted that the fish are on display, in the capable hands of the aquarists at the GLA. And yes, anyone who feels the current retail pricing is just too much to spend on a fish, you can now see one for the price of admission at a unique public aquarium on the shores of St. Louis Bay on Lake Superior. My special thanks for Alysee Shelton for taking the time to craft her article for the Duluth News Tribune – in a few hours I hope to see it in print!